A Halloween Costume fit for a Princess. Dive into the world of fantasy, dreams, and make believe with this gorgeous Cinderella Costume. This Cinderella Halloween Costume is inspired by one of the most popular Disney movies ever created. It will surely make your daughter’s Halloween one to remember, just like the fairy tale itself. 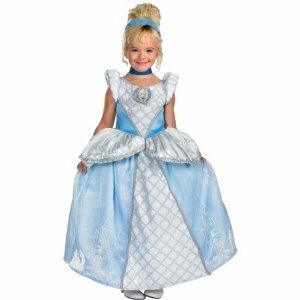 The Cinderella Prestige Costume will make your little girl the star of the show. While other children are dressed to scare, your girl will be dressed to impress. This Cinderella Costume comes complete with dress, petticoat, glittered character art, character cameo, matching headpiece and choker. Make this Halloween into a world of fantasy. Note that this Cinderella Costume is a big hit everywhere, especially Disney!